See a ripped JAY CUTLER overcome a superbly conditioned CHRIS CORMIER. We explore every sinew – every striation – the vascularity – in extreme closeup. During each of the muscularity callouts – such as “abs and thighs”, the camera roams over the muscle in the most amazing detail – you’ve never ever been this close before! FOR THE FIRST TIME EVER!! THE COMPLETE PREJUDGING FROM THE ARNOLD CLASSIC!! See a ripped JAY CUTLER overcome a superbly conditioned CHRIS CORMIER, as Jay walks away with the cheque and the Hummer. Not a single pose or comparison is omitted as you get a “fly on the wall” view from the CENTRE of front row of the photographers’ pit during rounds one and two of the prejudging. We explore every sinew – every striation – the vascularity – in extreme closeup. During each of the muscularity callouts – such as “abs and thighs”, the camera roams over the muscle in the most amazing detail – you’ve never ever been this close before! This is the only front-on view of these men as we had to shoot the evening FINALS from the rear of the stage, giving a reverse angle view. 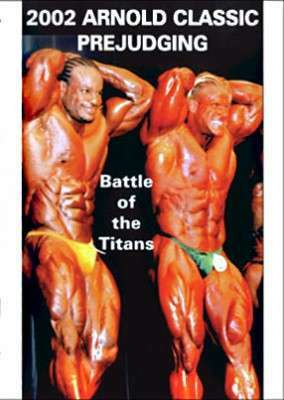 Who would have thought in 2002 that in 2007 we would see VICTOR MARTINEZ as the winner of the Arnold Classic!